With just eleven days to go until Christmas, Kensington Palace shared a festive surprise this morning. To the delight of royal watchers, Harry and Meghan chose a previously unseen photo from their Frogmore House wedding reception for their Christmas card photo. The black and white image captures a romantic moment when the couple were watching the fireworks display and holding hands. The image was taken by portrait and fashion photographer Chris Allerton. Windsor has always held a special place in Harry's and Meghan's hearts, and it will take on an even greater significance next year when they move to Frogmore Cottage, where they plan to base themselves and raise their family. 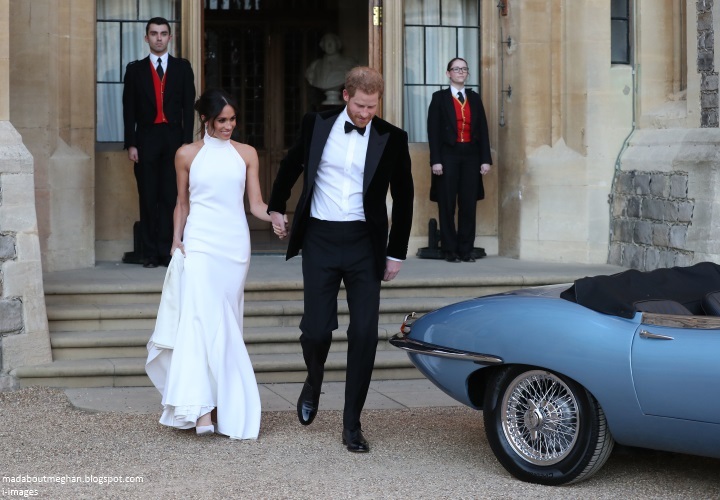 It was a treat to see another shot of Meghan's beautiful Stella McCartney gown. The Crepe Halterneck gown is currently available at Nordstrom and Net-A-Porter. The £3,500 piece is described: "Just one look at Stella McCartney's gown will tell you it's fit for royalty - quite literally, as Meghan Markle, Duchess of Sussex, wore this exact style at her wedding reception. Precisely cut from weighty crepe so it skims your curves, it has a column silhouette and long train that will look beautiful as you walk down the aisle and dance at the party afterwards. Wear it with a sleek updo to show off the open back." 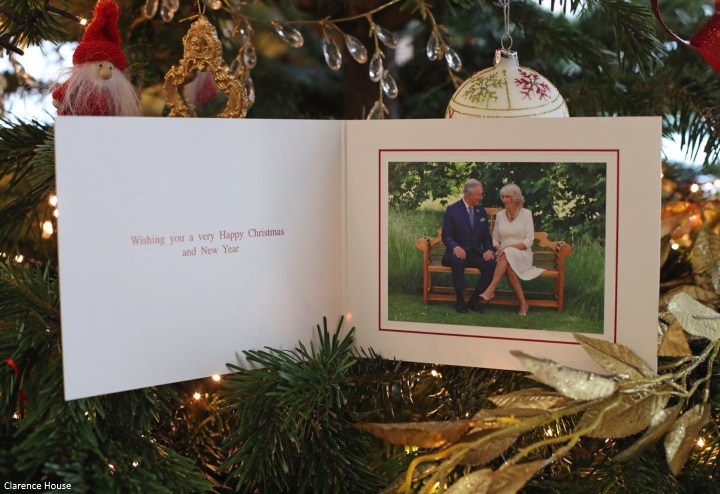 It was a delight to see the coordination between Kensington Palace and Clarence House, releasing Christmas card photos from their principals together. I'm hoping it heralds the beginning of a new tradition. 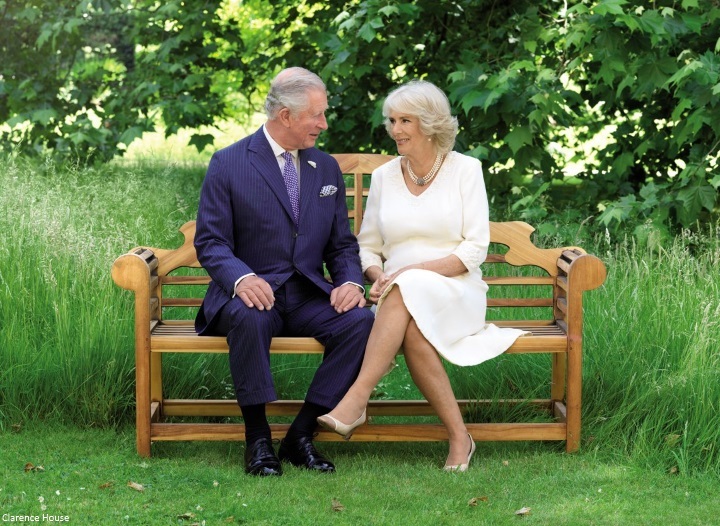 Below, the Prince of Wales and the Duchess of Cornwall pictured in the garden of Clarence House over the summer. The lovely photo was taken by Hugo Burnard. 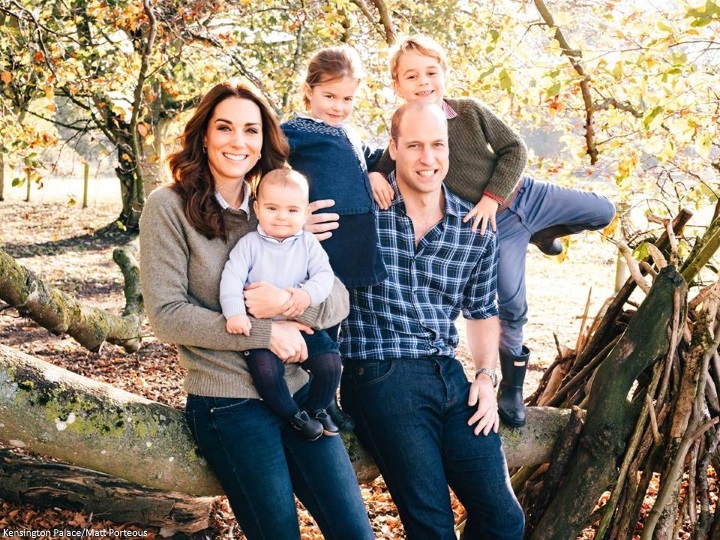 The Cambridges shared a fabulous family portrait taken at their country home Anmer Hall by photographer Matt Porteous. In other news, we have word on two private engagements Meghan carried out this week. On Tuesday, the Duke and Duchess attended a board meeting for the Queen's Commonwealth Trust. On Wednesday, Meghan had a private meeting with the National Theatre's artistic director Rufus Norris. Her Majesty is patron of the National Theatre. Finally, the Palace announced the Duchess will visit the Royal Variety Charity’s residential nursing and care home, Brinsworth House, on Tuesday 18th December. The Royal Variety Charity, of which the Queen is patron, assists those who have worked professionally in the entertainment industry and are in need of help and assistance as a result of old age, ill-health, or hard times. The visit follows the Duchess’s attendance at the Royal Variety Performance in November. Rebecca English reports: "Meghan apparently wanted to see first hand how the charity cares for those who have spent their lives working in the entertainment industry." I like H&M Christmas Card photo. Candid shots always say so much more to me then formal photos. I can actually picture it framed in their cottage. I do know it will insight much conversation among royal followers,.We will be reading for hours. Someone needs to make a Starbucks run!!! I believe you are correct that this choice in photo will elicit lots of comments again. But H&M made this choice knowing people will have opinions on it. Knowing that it will be “read” together with the very glamorous engagement photos and the beautiful (but not traditional) b&w wedding photo. That it will be released next to the Cambridges “family next door” photo. They could have used a informal pic from the tour, that would be more in line with Harry’s previous Christmas cards and get less comments, but they chose not to. So if they are happy with people having opinions about it, I am happy to read those opinion. As for the photo itself, I hope they blow it up and hang it in their bedroom in the new cottage. I think it's lovely. The royals don't exactly send Christmassy cards out, but this one looks very festive, which I like. I really don't understand why anyone would think there's anything wrong with it. It's very nice! I think this photo of Harry and Meghan tells a story. It allows us to look into the future together with Meghan and Harry. The future is bright and full of fireworks, so romantic yet passionate, just like this beautiful couple. Harry and Meghan are animated and naturally seek more attention than some people might find suitable, but I believe it is just their nature, not a bad thing necessarily. It is a beautiful photo, but I am not sure that it sums up the year, or makes me think of Christmas. I would have used this photo for the thank you card to the wedding guests, but that is just me. I think their wedding was the biggest event of the year for them, so a good representation of their year for a Christmas card. Photos don't always have to be Christmas-themed as other members of the royal family have demonstrated. Absolutely agree that their wedding was the biggest event of the year for Harry and Meghan. Of course, how could it not have been. It was an event that I followed with great interest and support. Personally however, I would have loved to see their faces in the photo, and as some people have pointed out, together with their dogs maybe. I am a sucker for a Hallmark Christmas, so if I were a Princess or a Duchess or any kind of Royal, I would ensure my photo for the Annual Christmas Card was set in snow, as a minimum, Christmas Tree visible, preferably wearing Christmas colours :-) Merry Christmas! Beautiful Photos,gorgeous.As for the "Step-Sister"( Who can't keep quiet!) she reminds me of Serena,from the show "Bewitched" , Samantha's, Evil Cousin! .. The Sussex pic is nice. Very different, but in line with how they come across as a couple. Not very traditional, a bit flashy, but in their own little world together and in newlywed bliss. Charles and Camilla’s pic looks nice. Say what you will about their history, but I think they are truly happy together. I love the Cambridge picture. Louis is such an adorable chunk, Charlotte looks slightly mischievous, and George looks happy and carefree. Kate and William look completely content and happy with their family in the country. I’m surprised they chose this simply because it highlights Harry’s impending hair loss. It is their personal statement about themselves. The emphasis is on their royal beginning, without a hint of family ahead. Happy Christmas! Hahah! Thanks for making me laugh. William and Harry seem to share the early-hair-loss gene. You mentioned they are moving to Frogmore House next year. It is actually Frogmore Cottage they are moving to, which is near Frogmore House. Awww, I love this photo!!! 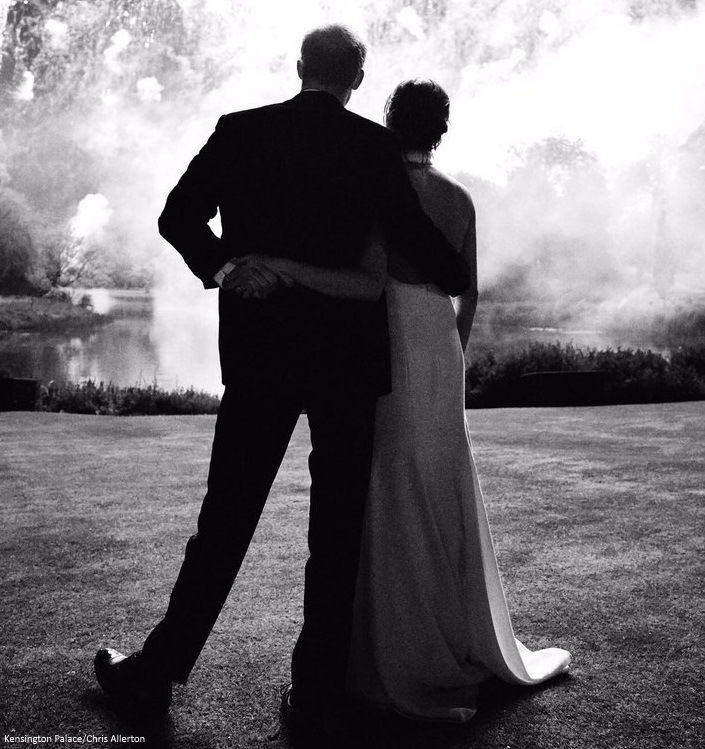 Being a sucker for B&W photography it made me really glad to see yet another beautiful B&W shot from Harry and Meghan's big day. I love how intertwined they are, not only with their arms around each other but how Harry is holding Meghan's hand as well, as though he just can't get enough of her. I hope 2019 will be a year of happiness, laughter and love for this beautiful couple. I think H&M's picture perfectly sums up their year... Intimacy and fireworks! And as has been said...it's them looking forward their future together. I'm sure next year's photo will be a family one of a more traditional (yet probably casual) nature. May this tradition of releasing the three photos together continue. Love them all and each is so apropos. I love the photo and it is an interesting choice. So different, like a New Year's Eve photo. But I have been missing seeing Harry and Meghan interact since the tour, and this says that Harry is crazy about Meghan and is in full protection mode! Very romantic. Quite a contrast to the other two, both of which are just delightful! Allison, I had the same thought. Happy New Year! It truly represents them well. Love all individual choices. Thank you for sharing Charlotte and Happy Christmas. I love the photo - the feeling of them sharing a special moment from what they clearly felt was the best day of their year/lives, the feeling of you and me together facing the future, and the intertwined hands - he has her back, literally. Of course it may not be that deep and they just liked the photo. LOL. We're lucky Harry didn't Photoshop in a little sign on the back of his jacket saying "Get lost." I do love how fierce he appears from behind. This is a beautiful photo but I'm not sure I'd use this as a Christmas card photo? This is more like a framed photo in a residence, maybe a photo sent along with thank you notes to wedding guests. But Christmas to me calls for something a bit more approachable, friendly, everyday. Pictures of dogs, etc. With their back turned they look like they are enjoying a private moment which is fine and lovely -- but it is a private moment. A Christmas photo usually shouldn't make the viewer look like they are intruding on a private moment. I had the same issue with the stiff, formal Cambridge photo from last year. I agree with you Ivy Lin. It's definitely a beautiful picture that by itself would be better as a thank you to wedding guests, but would have been great in a montage of pictures like many do at Christmas to depict events throughout the year, but then that probably wouldn't be royal would it? By the way, I read that Dorian Ragland had had an invitation from the Queen to spend Christmas with the BRF , any confirmation ? The latest story is there never was a Christmas invitation to Doria. My guess it that while it is not impossible that Doria was invited it is highly unlikely. By all accounts Sandringham is filled to the rafters at Christmas. Inviting one of the grandkids mother-in-law is opening a can of worms - not royal protocol worms, ordinary family worms - if Doria gets invited why not the Middletons, or Autumn’s folks ot the Tindalls? Where do you draw the line? But I won’t be surprised if one day when Charles is king we see a completely different Christmas arrangement that often include Doria and the Middletons. 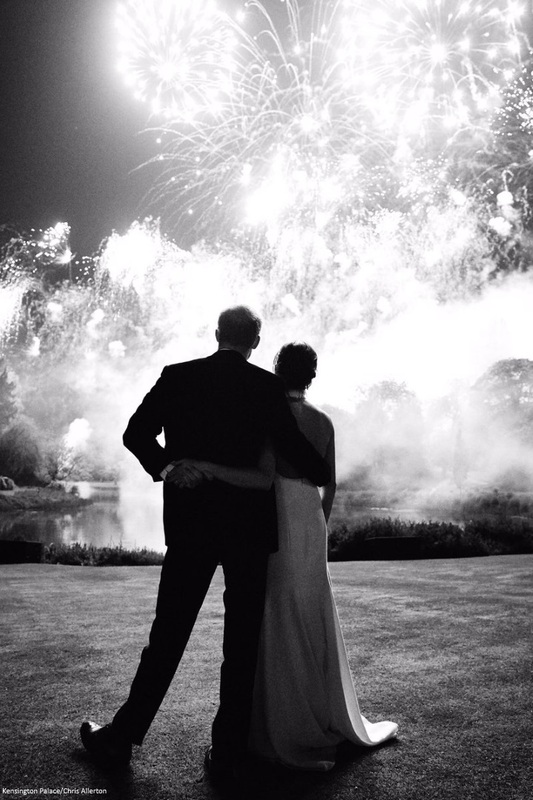 It’s a very elegant picture, I have a similar photo from when I got married but ya I had no private fireworks display just lowly sparklers!!! I think it’s obviously a lovely sophisticated photo but it does absolutely nothing to pull them away from the public perception of being flashy/Hollywood still. As with their engagement photos it looks like an ad for jewelry. Again, a lot of couples do these sorts of poses etc but as we have seen, a lot of people look to the royals as reserved and steady with a subdued elegance (yes I include myself in this too). They are not celebrities but public figures. I think the Sussex’s are marching to the beat of their own drum and they are hardly doing anything to destroy the monarchy, it’s harmless. But part of me worries about the glamorous side overtaking the good they can possibly do in the public eye. Fergie comes to mind with her spending and Princess Margaret. Diana was able to strike a bit of balance. We have seen what these two are capable of in terms of the good they can do, hopefully they can strike the balance of serving the Commonwealth and the UK with humility and just tip their toe in the Hollywood glamour. That was quite the tangent, but it has been on my mind with some of the pictures and events that have been chosen (the engagement photos with that very expensive very splashy dress and the amount of very expensive clothes and the fashion awards with the boomerang) The backlash has been fierce. No hornets here. :) I am a devoted H&M fan but I wish everyone in the RF could stop spending so much on clothes! Kate's recent very, very nice dress for only 325 pounds still is more than most people would ever consider spending for a dress. I had hoped that Meghan would wear reasonably priced clothes at least half the time, and I remember (I think) when one could actually see Kate's clothes and debate purchasing them. Now the York daughters are wearing clothes that cost thousands of dollars; I preferred some of the choices from Meghan's pre-wedding outings. Maybe it's a good return on investment -- more attention and more tourism. I don't know. I was thinking when I read the stories that Harry has changed so much and that Meghan made him give up Christmas shooting (go, Meghan!! ), that no one cites how much Meghan has given up. Some of it's good -- instead of her hypocritical father, the future King of England walks her down the aisle. She's pregnant. But the continuing non-stories are just stupid. Harry must be so mad. Absolutely fabulous photo! I love that Harry and Meghan are doing things their way! This is THEIR Christmas card! Who cares whether other people like it or not! How does one go about getting on their Christmas card list? Do you know? There is no Christmas card list, This is the official photo send out by KP as a reply when anyone sends them a Christmas card. Send a card to them and this will be sent to you. Send them a card! Gert's Royals has addresses and other information re correspondence with all the Totals. Great photo to mark their first Christmas together as a married couple. Next year we’ll get the Sussex family photo- baby and all- perhaps in their new home. For a nostalgic journey, I looked at older royal Christmas cards. There were lovely photos of Diana and Charles, Camilla and Charles, Kate and Will -before kids and after, and one of Harry in his bachelor days. It makes me glance at my family collection of Christmas cards this year. This year will be the first year I won’t have a card from any of the grandparents, while my brother’s family Christmas card shows him as a (very young;) new grandfather holding his first grandchild. These annual photos mark the passage of time, of the important comings and goings of the events and people in our lives. Which reminds me to stop procrastinating and get my cards done and mailed, like a week ago. LOL. I love this photo of Harry and Meghan. It’s very fairy tale like their romance. But the embrace also shows their deep love and connection to and for each other. This photo speaks volumes about their bond. Given all the pressure they are under due to the negative stories about Meghan, I find this photo very reassuring. It says we got each other’s back. Phew! I think it's a lovely photo. Very New Year's Eve. I'm glad they released a photo - despite all the bad press lately for Megs. A lovely photo. Very dramatic, and the lighting is wonderful. I really like all three photos. Each one is very suitable to the family it represents. Love it! Fireworks to welcome the New year! I love this picture of Harry and Meaghan. Anytime we can see another picture from their beautiful wedding . . . I'll take it. Actually I think all three of the photos are great! I'm glad we got to see three new pictures and they didn't reuse a previously seen photo. I am the only one who thinks she may be a patron of Brinsworth soon? :) All the shots are great, I love them all. Do we think they will go to the Queen's pre-Christmas lunch? Yes, absolutely they will attend. Why is this a question? Only because Charlotte mentioned it in the Kate blog and didn't mention it here. I figured they would since they went last year, but just wondered. My gosh, y’all. I had no idea there were “traditional” or “non-traditional” holiday cards! I thought individuals and families sent out cards with photos that they wanted to share with loved ones—people often send us cards that contain a photo that marks an important event during the year. I don’t find anything unusual in sending out a card that marks their wedding or that includes fireworks or that is black and white. Maybe it’s because I’m American? The more I look at it, the more I like their choice. Yes it has the perfume add feel, but that is obviously something they like. It features the highlight of their year and we have seen from previous Christmas cards that the BRF doesn’t really do festive/christmas themed photos. Although I think I would have preferred the colour version of the photo. Those beautiful fireworks would have been very festive. It might be a bit glamorous and featuring their backs unusual but is exactly that that means it is in no way competing with the Cambridges. And yes it is not a competition but bear with me. If I am a newspaper editor and my reporter put both photos in front of asking which one to use for the front page, the Cambridges is the obvious choice. I think H&M have a much better grip on this second in line thing than people give them credit for. I'm impressed to see the pictures. .. I think all three are brilliant photos that captures each of the families in their current states: Cambridge young family, Sussex beginning a life together, Wales empty nesters. Cambridge and Wales pictures beautifully traditional, Sussexes romantic and symbolizes them as a couple and the key event of their year. Sussexes have "Hollywood" thrown at them quite a bit, and it comes across as a disapproving comment as though glamour and strength of character must be mutually exclusive. I don't think Harry and Meghan seek the limelight except when they are "on the job". Just consider how they fly on the radar and disappear for weeks on end. There is no woman more quintessentially English than Kate, IMO, but Meghan is not English. Although I don't think Meghan does anything to shout "I am American," I don't know how some people expect her to be. Harry is also quintessentially English, so can his wife be both a British citizen (eventually) and a citizen of the world in her outlook? Does the British not benefit from broadening their appeal? I think the Cambridges have Englishness all sewn up. I think you make several good points. I don't think it's wrong for Harry and Meghan to be more international in outlook. In fact, it's appropriate that they be 'outward' looking given British politics at the moment and their role as ambassadors for the commonwealth. However, I don't think they should lose sight of the fact that they are funded by British taxpayers and that some of their time and priorities need to reflect this. People love things they haven't seen before -- this is a new view on the after-wedding, so it's great. However, three kids looking different at every age is something really new, so it's hard to try to compare cards. And it will be interesting to see what M&H d with her little one next year. K&W were so smart in letting the public see their kids at many stages so there's no fighting to try to get a photo of them. Will be interesting to see how Harry feels about his kid. Wow, an awesome photographer. He captured a very beautiful romantic moment. A very lovely photo. I agree Anonymous @22:22. I think the Duchess of Sussex is of the OPINION, I have WORK to do. The Duchess has been under the radar, but on the job. Thanks, Charlotte for sharing all three pictures. I enjoyed looking at all three. I think the card is a beautiful piece of art. I'm not surprised they chose something pre-baby as Meghan's appearance is continually evolving. I think Charles and Camilla have an exquisitely constructed photo as well the backdrop is stunning and their expressions are so sincere. Cambridge's photo looks over exposed to me - not the best time of day for an outdoor photo - and Kate's heavy makeup and photoshopping/foundation looks odd with the rest of the family's natural coloring/features. Nice to see you, moxie. I love all three pictures. They are so different but all three photos are wonderful! I love the Cambridge family picture!The wedding picture clearly shows that the beginning of their family! It is not an obvious choice but I liked it! I like the picture per se. For me it is strange they show the back to the viewer. I like all 3 cards. Each reflects the life stages each family is having at this point. All are wonderful holiday cards. I would be very glad to receive any from the mail! Very different. But I absolutely love the photo they chose for their card. We've all known Harry has always been individually different from William. Now that he has Meghan by his side - I'm glad to see them carve out a different direction as modern royals while W & K pursue the more traditional route, which I like. I think both couples have something different to bring to BRF that actually extend the continuation of the Monarchy. That being said I loved all 3 pictures - they were a great representation of each family at the stage they are at. Can't wait to get my copies in the mail. Of the 3 pics I only like Charles and Camilla’s - I want to get Harry and George to stand on two legs, call me old fashioned but there is something about the way they are positioned that really draws my eye, and not in a good way. I don’t mind the back view and black & white, just the leg!! Sorry I do not like it, I believe it belongs only in their private collection...I think it’s a bit boastful, not everyone can enjoy such an outlandish display of fireworks at their wedding. And when you send a greeting, it is terribly rude to not show your face with a smile. I do not understand who continues to make these choices but someone needs to wise up. I love Meghan and Harry, I am not a royal and certainly know better than this. It’s good sometimes to be over the top but traditional also has its merits. I share your feelings, Indigoisle. Not that I don't like the picture - it sure is artistic and special and I understand why they like it but for me it is not the best choice for a Christmas card. I prefer W&K's card for a Christmas card, much more friendly. The picture H&M picked is nice, just doesn't feel Christmasy to me. Love their first Christmas card, well said Anonymous14 December 2018 at 18:31 ! Maybe they don't have their backs to you but you are standing with them, looking ahead as they are? I commented about these three Christmas cards over on DKB, and I like them all. I would just add that there are very interesting effects in the pictures. For instance, the shared angle of Charles and Camilla's legs, the apparently fallen tree off to the left in the Cambridge photo which looks like a giant elf's leg and foot, the symmetry of train on the right and shoe on the left in the Sussex picture. The photographers were evidently paying close attention, or choosing settings and posing carefully to get these seemingly symbolic statements. I wish I could hear them talk about their preparations for the photography. If only the fire work was in color and the photo shows them facing whomever they they send it to,it would have complemented some of the colors and the spirit of Christmas. It seems they are making a black and white photo story telling series. The engagement, that one wedding day photo, and this for Christmas. Regardless, it is a romantic photo, different, thought provoking and special. I hope their firework will continue throughout their lives. I do love the picture of Prince Charles and Camilla. Their kindness towards each other, respect, admiration and sheer comfort in each others prescence is delightful. I believe this photo captures their loving relationship so well.